At a whistle a gaggle of forty-some marginally uniformed men piled out of two trucks and spread out over the chosen work site. They ranged in age from teenage to forty-something. Another truck held sections of pre-fabricated frame work. One team of men got to work rigging sections to be lifted by a small tractor crane, which was then moving up into position between that truck and the planned span. The officers stood to one side pointing at nearby hills and depressions. The conversation I overheard was about what sort of security they would require to make a bridge here. Engineers are easy targets when up on the front line. Two teams dug by hand to set the near side footers. Using the crane, the rigging team had laid out and connected the leading two ten foot long bridge sections and were rigging a third when the footer teams got their supports adjusted level with each other. By eye I figured they could cover this span with four sections, plus short on-off ramps. They could set the whole thing with two more lifts of the crane. But then another whistle blew and everyone stopped to look. One of the officers jogged over to the crane and stepped up to the cab, telling the driver something over the sound of its compact diesel. The engine stopped as the officer stepped back down. The driver stood up, leaning out of the cab, with a dumb grin on his face. “This piece of equipment has been taken out of commission by ‘enemy action’. You fellahs are on your own!” The driver crawled out onto the front deck of his mechanical casualty and sat down to watch the show. It was a good show. Confusion reigned for just a moment, workmen not sure which tools they should be holding. The officers in this bunch knew what they were doing though, and they jumped straight into the job. All the interconnected pieces were broken down. Every man, officer and enlisted, took hold of a hot steel bar and they walked each piece to the river bank and onto the waiting supports. Beads of sweat and expressions of profanity flowed off the men as they forced their will upon the heavy steel. 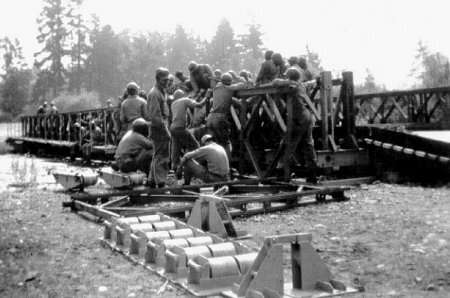 There are integrated rollers in this bridge system, so each piece can be rolled out half way, the next piece attached, and the deck extended progressively. The anchor men waded across with their tools to work on the receiving side, coming back several times for more tools and bigger levers. The entire bridge would need to be manhandled once the free end of it got across to the other supports. Eventually two large driftwood logs were commandeered into service as pry bars, and the span was set and ready for a test run. The young fellows looked overly happy running vehicles across. First one drove an empty jeep and soon groups were riding over on the truck with all their tools. They had completed a satisfying job. I didn’t dare to remind them that their next job would be to come back and break down all those practice bridges.